Ackelsberg, Martha A. 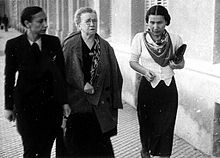 Free Women of Spain: Anarchism and the Struggle for the Emancipation of Women. Bloomington, IN: Indiana University Press, 1991. Enders and Radcliff. Constructing Spanish womanhood: female identity in modern Spain. SUNY Press, 1999. Linhard, Tabea Alexa. Fearless women in the Mexican Revolution and the Spanish Civil War. University of Missouri Press, 2005. Nash, Mary. Defying Male Civilization: Women in the Spanish Civil War. Denver, CO.: Arden Press, 1995.